Dave and I had the honor of attending a wedding this evening. We went with great anticipation. 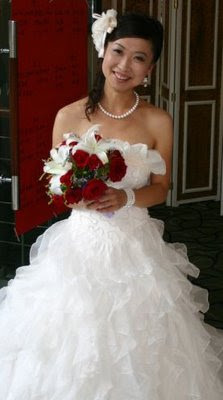 This was to be our first Chinese wedding, and we looked forward to all of the cultural differences. We know that the marriage process differs from the United States. Here, engagement is the exception to the truth - it happens, but seeminly only in couples copying Western practices. Generally, a couple goes to the local government office and gets married. Its akin to getting your marriage license in the states, except that you're getting the entire marriage. Its not a big deal. Something you tell your friends in the office the next day. So, what did you do this weekend? We got married. The difference in process coupled with religious and cultural differences made us quite interested. As it turned out, our experience was a bit diluted. 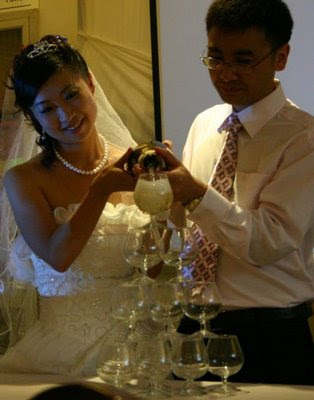 The bride hails from Qingdao, and they held their wedding banquet there. The banquet in Shanghai, which we attended, was a secondary banquet and rather small. We may well have missed some of the major festivities. Also diluting our evening was the lack of S--'s patience. She struggles to sleep once the sun has been up - and the sun rose this morning at 4:56am. Still, we enjoyed the experience. Early into the evening I wished I had brought some paper to take notes. Lacking paper or a pen, I resorted to photojournalism. She is the bride, and one of Dave's co-workers. This is the first dress she wore. We saw two outfits, but I'm confident there were more costume changes over the course of the evening. No doubt this was a rented dress, possibly used in their wedding pictures - which have no ties to an actual event. Wedding pictures in China are the event - the most expensive part of the wedding process, and months away from either the marriage of the reception. 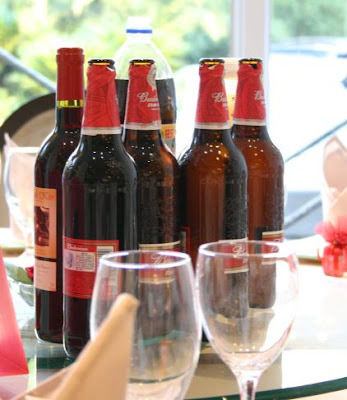 This is the open bar - large bottles of Budweiser (this is an import, remember), a bottle of wine and a bottle of Pepsi on the table. Bottles were quickly replaced as they got low. It gave this classy space a bit of a Knights of Columbus feel. 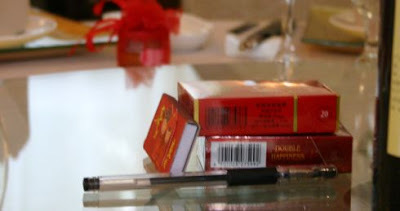 Oh yeah, and the two boxes of cigarettes. These were part of the open bar as well. They began serving food as soon as the room became crowded. Some of it sat on the table for quite some time, which seemed of no real consequence to anyone. 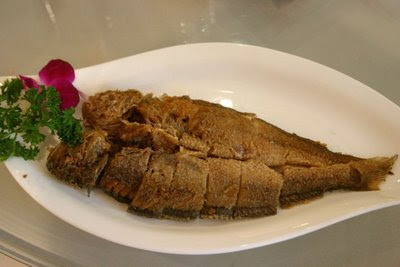 This is two fried fish. And yes, I ate it. And no, I didn't like it. Chinese culture is steeped in symbolism. I asked my neighbor if everything served this evening had some sort of symbolism. He scoffed. He is a young twenty-something who just returned last year from 5 years in Canada, but I think his attitude was true of most people of his generation. He said that things supposedly have some symbolism to them, but its not the point anymore. They just follow tradition. Still... we all received a small pot of honey as a favor. 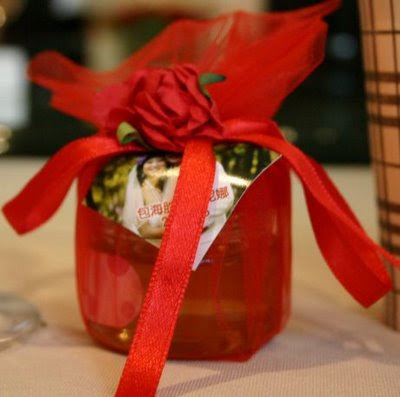 Sweet favors are the norm, symbolising good luck. Food was the central point of the event. At least for us it was. A man, an emcee of sorts, stood with a microphone and made people laugh with great regularity. It is entirely possible that his entertainment was the central point of the event, but we missed it entirely. We enjoyed the food. 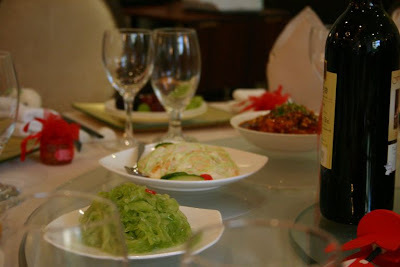 Chinese meals are all eaten family style, and large groups are always served with a lazy susan in the middle. You take a few bites off of the serving dish, eat them off of your plate, and then dig into the next serving dish. You're lucky if your favorite dish sits right in front of you - you can nibble away at it for quite a while. The event contained very little ceremony. This seemed a bit like cutting the cake together in the states, but without any silliness. They never distributed the champagne to anyone. 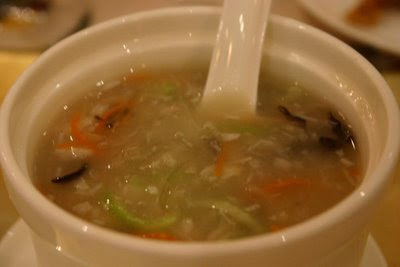 A later course in the evening, this is shark's fin soup. It was tasty, but apparently also wildly unethical. Still... tasty. After a change of clothes, the couple accepted a toast from every table in the room. This crowd was mall - under 100 people and less than 8 tables, so the couple felt fine afterward. At a large wedding, this event makes good progress toward getting the couple wildly drunk. And unfortunately, this is where our evening ended. S-- entirely fell part, worse than I've ever seen. The poor girl could not stop crying hysterically, so we brought her home and put her straight to bed. No doubt the party lingers on at this hour, just without us. We had a lovely evening, but overall I was struck by how not different this event was. It felt very much like a Western wedding reception being held at a Chinese restaurant.